Patrons that wish to take the train to this event are advised to stop at the CLAREMONT station as this is closer to Gate One that the Showgrounds stop. Gate One Theatre is located at the Claremont Showgrounds and is access via Gate One of the Show Grounds off Graylands Rd. 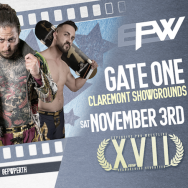 EPW REAWAKENING XVII is coming to Gate One at the Claremont Showgrounds on November 3rd 2018 in the new home of Explosive Pro Wrestling. 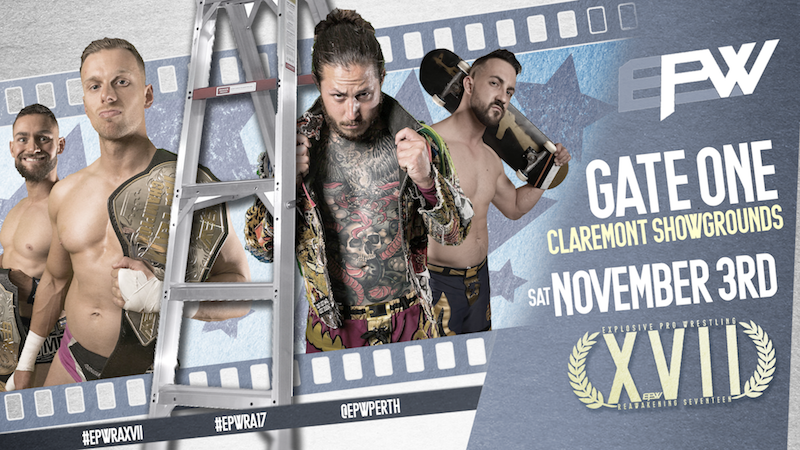 The MAIN EVENT for the evening is a TAG TEAM LADDER MATCH with the current Tag Champions ‘The Untouchables’ Damian Slater and Marcius Pitt taking on the ‘Street Gang Hooligans’ Alex Kingston & Logan Grey. EPW are now able to offer limited premium seating options which will secure your seat in the front row around the ring or the first three rows on stage. Now it’s easier to ensure you are guaranteed to be the closest to the action! Are you on the Road to ReAwakening? Catch up and check out EPW online! PREMIUM RESERVED HAS SOLD OUT!